Knowing how to prepare for a hurricane and the effects of a serious storm are crucial if you live in areas prone to these extreme weather events. From storm-surges and destructive gales, to blackouts and devastating flooding, having a strategy in place for a major hurricane or tropical storm hit will help you weather the worst of the conditions and minimize the adverse effects on you, your family, and your home. If a hurricane watch is in place or an alert is issued in your local area, it pays to have a preparedness strategy and action in place that you can implement at the earliest opportunity. From structural damage and flooding, to power outages and temporary breakdown of services, the effects before, during and after a hurricane can cause devastation and serious disruption when these storms make landfall. A hurricane is a massive storm system that forms over the sea before making landfall and unleashing a combination of potentially deadly weather events as it continues inland on it’s path. While the term hurricane is the name typically given to these severe weather systems when they form over the Atlantic or eastern Pacific oceans, over the northern Pacific, these events are known as typhoons and in the south Pacific and Indian oceans, the name cyclone is used. The classic effects of a serious hurricane usually include high winds and torrential rainfall, accompanied with storm surges in coastal areas, all of which can wreak havoc in the form of property damage, flooding, and loss of power when lines are down. Knowing when to expect a hurricane or severe storm system can be a difficult prediction to make significantly ahead of time and while forecasting services such as the National Hurricane Center provide frequent updates for the US, the advanced notice you’re likely to get in the event of an impending storm may still be limited. With that being said. hurricane seasons tend to follow a pattern with the Atlantic based season running from around the end of May to the end of November, peaking from August-October. For the Pacific, hurricane season is between mid May and the end of November. Climate conditions play the biggest role in determining the likely severity of a tropical storm system, with everything from wind patterns to surface sea temperatures playing a role in the likelihood of serious hurricane systems forming. While the pattern of hurricanes tends to fluctuate year on year, NOAA have forecast that 2018 is likely to be highly active in the Atlantic region, with activity reaching levels not seen since 2010. The intensity of a hurricane is measured using the Saffir-Simpson Hurricane Wind Scale, a 1 to 5 rating system which looks at the sustained wind speed of the storm and basically estimating the likely amount of potential damage that will be caused to areas and property when the storm strikes. You’ve probably heard of the term ‘Category’ used to describe hurricanes and typhoons in the past, and these are basically the ‘levels’ of severity which move up the scale. In this case a Category 5 represents the most devastating storms while Category 1 is used to denote the lowest (although still potentially deadly) level. Anything above a Category 3 is generally considered a major storm with the highest potential for a loss of life and severe damage to property and infrastructure. Exterior damage to homes with branches snapping from trees. Damage to power grid could occur, causing power outage for several days. Roof and siding damage is likely to homes. Shallow rooted trees will be affected and may pose danger from falling as well as blocking roads ad access routes. Loss of power should be prepared for, lasting for several days to weeks. Damage to homes is likely with roof and exterior features most at risk. Danger from falling branches of trees and subsequent effects on roads, transport and power/utilities. Access to electricity and water will likely be disrupted for several days until storm has fully passed. Severe damage is likely to be inflicted on well constructed homes with damage to roof and exterior walls. Trees will almost certainly be downed as will power lines causing initial blackout and loss of power for several weeks. Expect a large number of framed home destruction alongside uprooted/fallen trees and power lines causing total power outages, potentially isolating communities. Highly likely that power will not be reconnected for many weeks and even months. In some ways, preparing for a hurricane is similar to planning and being ready for a number of other natural disasters such as earthquakes, blizzards, or wildfires in that there is a degree of probability that you can attribute to the likely risk you face, depending on certain factors such as where you live or the time of year. As well as this, some of the likely adverse effects and likely conditions will be similar across disasters as the usual requirements for survival and basic access to services and utilities come under threat – things like physical safety, warmth, and access to water, food, and power. With that being said however, there are a number of factors which are unique to hurricanes and severe storms and knowing how to prepare for a hurricane requires careful consideration of the basics of survival plus the specific requirements of this unique type of disaster which might otherwise be overlooked. Earlier in the guide we talked about where hurricanes typically form before reaching land and this gives a good entry level insight into the kinds of regions most at risk from this kind of extreme weather event. When you think of some of the most recent serious hurricanes that have occurred over years, storms like Hurricanes Sandy and Katrina (both Category 3 upon landfall) and Harvey (Category 4) probably come to mind immediately for their severity and the sheer amount of destruction and disruption caused when they reached land. The common element for all of these super-storms was that they each hit highly populated coastal regions, with severe systems coming in from the Atlantic and Gulf of Mexico respectively, and as a result of this, major disruption and devastating damage were the end result when they made landfall. In all of these cases, as with numerous others relating to hurricanes and tropical storms around the world, there’s usually a one-two punch of extreme wind speeds and flooding that develop and unfold once the storm makes landfall. With this in mind, start by carrying out an assessment of your local area, paying particular attention to the history of hurricanes and major storms (and flooding) as well as the geographical factors of where you live such as the proximity to the coast, rivers, lakes, and the contours of the land in your region – are you on a hill or on low-lying land for example? Once you have an idea of these factors, begin looking at the secondary risks in the immediate vicinity of your property and further afield to get an idea of what the direct effects of a storm would look like if your area were to be hit tomorrow. In this case, you want to be paying particular attention to the construction of your home, the proximity of trees and power lines, and the immediate access points to your home and the surrounding roads – could you evacuate safely by vehicle after the storm if required? 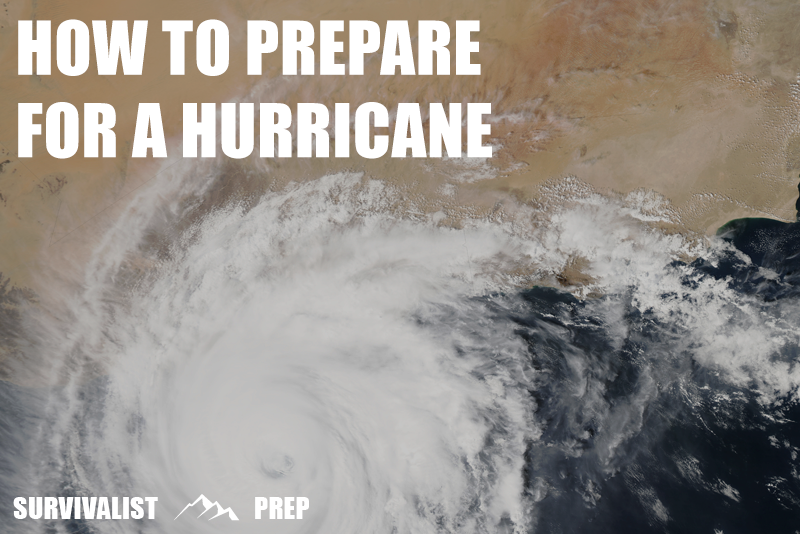 Knowing how to prepare for a hurricane means knowing specifically the kinds of events that are likely to unfold before, during, and after a serious storm or hurricane hits and preparing accordingly. While the immediate effects of a hurricane may seem obvious (wind and flood damage probably come to mind first), it’s often the overlooked elements before and after a storm strikes that catch most people off guard, so these should also be given careful consideration in your disaster preparedness planning. With a hurricane or serious storm situation just around the corner, you’re likely to have at least some pre-advanced warning of what’s heading your way. Your first port of call when keeping an eye on the likely weather events around the corner (particularly if between May and December) should be the National Hurricane Center’s Storm Outlook information page. Check this resource on a semi-regular basis during hurricane season, particularly if you’re based in an at-risk area. If you have access to a home weather station of some kind, you’re also going to have a pretty good idea of any major changes to local conditions that seem out of the ordinary. While pre-advanced warning of any impending emergency situation or disaster is always beneficial, this can be both a blessing and a curse, depending on your level of preparedness ahead of time. On the plus side, the initial warning provides you valuable time to make any final preparations and to batten down the hatches if you’re intending to ride out the storm from your home. Similarly, if your hurricane preparedness plan has you evacuating the area (maybe due to the predicted severity of the storm), then having a bug out bag and vehicle in place beforehand means you can up and go without a moment’s notice, beating the inevitable traffic chaos and potential gridlock on the roads. Of course the opposite is also true and if you find yourself somewhat behind on the preparation front, the drawback of advanced notice is that everyone else in the same boat will be scrambling to get out of town or to stock up on rapidly depleting supplies from the stores. It’s therefore important to have a good understanding of some of the most likely (and commonly observed) outcomes that are likely to happen ahead of a major storm or hurricane making landfall. Almost without fail, whenever there’s a warning issued of an impending or imminent emergency, people take to the stores and begin to clear the shelves. What makes this particularly problematic is that depending on the severity of the disaster, it could be days if not weeks until the stores are restocked and you’re able to resupply, particularly if the logistic chain and regional infrastructure are disrupted. Without a shadow of a doubt, the very best thing you can do to mitigate this is to have a resilient emergency food supply or survival pantry in place so you’re not dependent on the slim pickings left on the carcass of your local grocery store before or immediately after an emergency event or disaster strikes. The priorities when preparing your supplies in order of importance are water and food, plus enough required medications for every member of your family to last at least two weeks. Stock up on plenty of bottled drinking water to cover the minimum requirements for every member of your household as well as enough easy to prepare, high nutrition food to minimize the effect of a disaster on your dietary requirements. Aim to build up a steady supply of extra food over time that requires minimal (if any) preparation under the assumption that in a hurricane situation, you may not have the means to cook your food. With water taken care of, an excellent two-way investment for almost any disaster situation is an emergency meal kit and a camp stove with plenty of spare fuel to see you through the storm. If you come to the decision that you’ll need to leave home ahead of the hurricane’s arrival, there’s a very good chance other people will eventually decide on this course of action too. You should expect serious crowds of people at the gas station looking to fuel up, leading to an eventual depletion and potentially days before a tanker is able to resupply the pumps. The major routes out of the area will almost certainly be heavy with traffic if not gridlocked entirely. What’s more, you can expect that if the weather is already beginning to close in (coupled with erratic behavior of panicked motorists), road traffic accidents – and therefore delays on the road – will be much higher than usual. Both of these major and highly likely scenarios are avoidable by having a watertight plan in place to hit the road as soon as you know the situation requires it and having a bug out strategy including a destination, vehicle, and bag in place to get you out of town, ahead of the crowd. There will almost certainly be a narrow window of opportunity (kind of like the calm before the storm) where those who are prepared can kick in to action an auto-pilot evacuation mode and literally get out before everyone has the same idea. Know it, be prepared ahead of time and use this opportunity to your advantage while you can. When the storm hits, the issues will shift from human causes to natural considerations with the biggest threats coming from the hurricane itself. The two obvious issues here will come from wind and water, with each presenting a different but equally deadly set of challenges that need to be prepared for. Hurricanes are primarily known for the destructive power of the associated winds, with higher category storms wreaking the most havoc on property and infrastructure. Do not venture outside while the storm is raging. The majority of all injuries and fatalities from severe winds and gale scenarios (such as in a hurricane or tornado) come from flying debris. We’re talking about trees being uprooted, road signs hurtling through the air, and previously harmless inanimate objects like trash cans and garden ornaments suddenly becoming deadly airborne projectiles. Without putting it too bluntly, if you are outside during the full force of a hurricane or severe storm, you’re quite literally putting your life in harm’s way and the results could be fatal. If you’re caught in the hurricane itself, immediately seek shelter in as sturdy a structure as possible until the storm has passed completely. Fixed frame buildings offer a higher level of protection than those without this structural support in these situations – a bus stop shelter or shed in the backyard isn’t what you’re looking for here! Another often overlooked effect of a hurricane reaching land in coastal areas is the accompanying storm surge which can cause widespread damage to low-lying areas near water. Similar to a tsunami in principle (although not caused by an earthquake or seismic event) storm surges are effectively a rising of the sea level which pushes inland causing sever coastal flooding to the immediate vicinity and along path of the surge. In tropical cyclones where storms hit flat coastal areas, these surges and the associated flooding are often the leading cause of casualties. If a hurricane is forecast to be severe and you live in a coastal area, you should also prepare for this potential outcome in the event of a major storm and plan against the effects of flooding as a priority. Wind at hurricane levels often leads to blackouts and power cuts either directly through knocking out the power lines or through fallen trees which can disrupt or disconnect the lines entirely. The immediate result of this will mean that you could be cut off from the grid and a supply of electricity in an instant. With this in mind, it’s imperative that you’ve built a good level of redundancy into your survival planning for this kind of situation. If the lines are down, you could be without power for days if not longer, so putting together a strategy for dealing with a short-mid term power outage is an excellent way to build resilience into your plan and being able to implement this the moment the lights go out should form a core component of your preparations. When the most serious weather effects of a hurricane or tropical storm have passed, the danger is often far from over. Knowing how to prepare for and react to the most serious follow-on risks of a major hurricane is an essential step in preparing against the worst effects of a tropical storm system. While a storm surge can represent the clear and present danger from water during a hurricane, the after-effects of intense and prolonged rain, combined with the consequences of any initial coastal flooding can be majorly disruptive for days if not weeks after the storm has cleared. In the case of serious storms such as Katrina in 2005, the deadly combination of wind and surge caused flood-protection infrastructure to catastrophically fail and resulted in widespread flooding of up to 80% of New Orleans, followed by a breakdown of civil order and plummeting sanitary conditions throughout the city with a now infamously slow government aid response. With this example alone, it’s clear that the potential damage after a storm has passed can be just as deadly, if not more so than the hurricane itself. If you live in an area prone to severe tropical storms or hurricanes, preparing for extensive flooding should form a priority element of your emergency response plan, making sure that you have a strategy in place to deal with rapidly rising water levels and means to protect your property from flood damage wherever possible. Flooding can come in the form of coastal flooding, river flooding and torrential rains overpowering the drainage systems. If any of these factors combine in a low-lying area, you’re almost certainly at extremely high risk of flooding during a hurricane. As a first measure, be sure to check out the national flooding maps where you live (US, UK) for detailed information on flooding risks in your local area and then look to develop a plan for dealing with the adverse effects of extreme flooding if you’re in danger of being affected. home based flood defenses such as sandbags. If you’re at risk, stock up on home based flood defenses such as flood barriers or water diversion tubes. With wind damage potentially bringing down trees as well as physical structures and serious flooding effecting low-lying areas and valleys, there’s a very good chance that both minor and major access routes could be completely impassable for days on end until a rescue and recovery operation gets under way. In the case of ‘dry damage’, i.e. downed power lines, trees or other fallen debris, this will mean access by vehicle will not be an option, but travel on foot may be a suitable alternative if it’s safe to do so. For severe flooding on the other hand, water levels may be anything fom a few inches up to several feet, making access only an option with the use of a boat or similar floating craft. In the latter example, if you haven’t evacuated an at risk area before hand, it is highly recommended that you await emergency assistance unless your home has become absolutely unsafe to remain in. If evacuation of your home becomes a necessity however, you should look to invest in a high-quality survival dinghy of some kind as well life vests. Paired with a comprehensive bug out bag and a wide range of evacuation supplies, this may become your only way out of a severe flooding scenario if no other help is able to reach you and your home itself represents a clear and present threat to safety. As with all of our preparedness guides, we reference as many expert sources, real world user reviews, and opinions as possible so we’re able to provide the most relevant and educational information on how to prepare for a hurricane or tropical storm. Knowing how to prepare for a hurricane is ultimately a highly personal activity with individual needs and preferences sometimes varying considerably between people, locations, and specific situations. With these considerations in mind, this guide looks to provide advice on our own opinions of how to prepare for a hurricane, however, it’s always important to carry out your own due diligence to find the best solution for you when developing a strategy, plan, and solution that’s perfect for your situation.